Looks like there are going to be some great Air Max 95 colorways dropping this year. 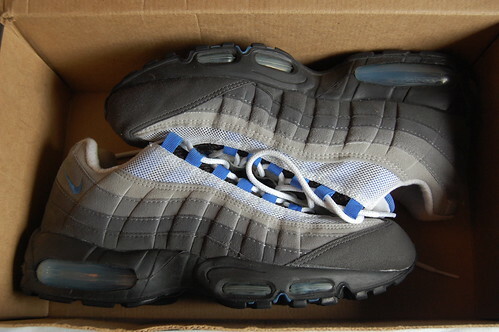 I think it would benefit all of us if we created a 2010 Air Max 95 thread similar to the Air Max 90 one. Im pretty sure there isnt one already but if there is, modz plz lock this up. Here are a few CWs that "should" be dropping this year... But correct me if Im wrong. Comets and Crustals for me! now here are some 95's!!! Those reverse grapes are sick. I will likely get all of those except the Pennys. This is gonna be a good year for AMs I guess. do we know what part of the year the crystal blue's will come out?? Comets, Reverse Grapes, Crystal Blues, maybe Neons. Thank you Nike. Slates are one of my all time favorites. I've been wearing a pair that's pretty beat...now time to cop multiple pairs!!! Ok UPDATE on the first post. are the neons a GR? Who the hell nicknamed those the "Reverse Grapes"? All but the Penny's are a MUST!!!! Were these posted yet? Forgot to add there JD exclusives, even though they now ship outside the UK why wouldn't nike make these a release in the states.